Show off Your Skin’s Natural Beauty this Summer 2018 with THREE Angelic Synthesis Foundation Serum! Happy Monday! The lovely folks at THREE Cosmetics in Singapore sent me a wonderful package last month, and I’ve been waiting to share it with you. 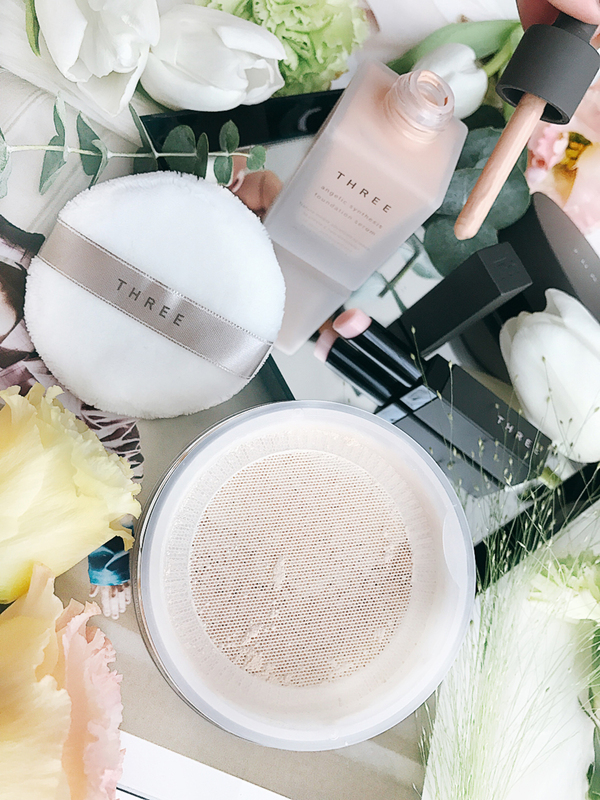 THREE Cosmetics is a lifestyle brand from Japan which prides itself on a holistic approach towards beauty and living. The range is almost exclusively sold in Japan, and so it was a major coup when it launched in Singapore last year. I had reviewed several pieces from their makeup line in the past [see here], and am excited to explore their latest base products and several pieces from their Summer 2018 point makeup range. Summer is always about carefree ease and natural beauty, so it is timely for THREE Cosmetics to launch its latest Angelic Synthesis Foundation Serum. This is a lightweight foundation that leaves the skin feeling perfectly comfortable and looking flawlessly natural. Interestingly, the texture is not drippy but feels almost mousse-like despite being dispensed via a dropper. However, it applies incredibly smoothly with an airy feel, and sets and becomes budge-proof within minutes. THREE Angelic Synthesis Foundation Serum is formulated with 83% naturally-derived ingredients, and contains 9 beneficial botanical extracts. This includes Geranium Robertianum extract (a potent antioxidant), Lactobacillus casei/Fermented pear juice (regulates skin chemistry to encourage healthy barrier function), Borage oil (anti-inflammation), Sea buckthorn oil (healing), Tea seed oil, Argan oil, Jojoba oil, Shea butter, and Beeswax. Full ingredient list here. **Feel free to click on image to open up in a separate window and zoom! 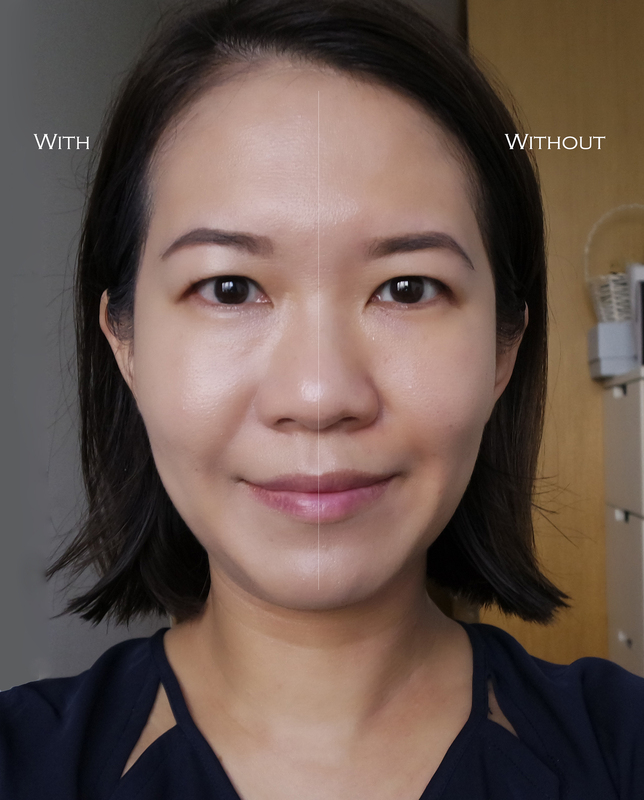 I received the shade 202 which looked somewhat dark to me initially, but blends out to lend a brightening effect as you can see in the half-faced comparison shot above. It sufficiently brightens up my undereye and conceals the redness around my nose, but if you have severe pigmentaion and scars a separate concealer will still be needed. When first applied, the finish is velvety and luminous, but after a couple of hours, my skin’s natural oils start to permeate, and I do notice some shine creeping up my t-zone by midday. The foundation itself does not break down nor oxidise though, and I’ve been able to wear it all day. To help keep the shine away, there is THREE Ultimate Diaphanous Loose Powder in a new matte version. Incredibly fine and airy, a loose dusting of this powder completely matinees the complexion and sets makeup. It comes with a luxurious thick puff that feels like being kissed by a baby. Or if you prefer, just gently dip your brush into the bouncy mesh, tap off any excess powder and swirl on the face. Full ingredients here. For me, I’ve always been plagued by wrinkles around the inner corner of my eye, along the nose bridge, from rubbing and scratching in my childhood. Foundations tend to sink into the lines and emphasis them. For these and any other facial lines, THREE has released the innovative Airlift Smoothing Wand. It comes in a slim concealer type wand and a creamy balm-like texture. A single swipe immediately veils the appearance of lines and wrinkles, without leaving any trace on the skin. Ingredients here. Apart from the base makeup, THREE has also released a few point makeup items for Summer 2018. For the eyes, achieve an easy elegant look with THREE Atmospheric Definition Mascara. With a fluffy curved brush, the mascara is able to grab hold of individual lashes and coat them with a light layer of fiber to lengthen naturally. It does not clump nor weighs down the lashes. Personally, I prefer my lashes much more voluminous and darker, and the Japanese aesthetic in this regard errs on the side of conservatism. To complement the natural effortless look, you can try the THREE Captivating Performance Fluid Eyeliner, which is a click pen-type liquid liner. The brush tip has a nice flick and is thin enough for a fine tip. However I found that the capillary action does not fully deliver the liner to the very tip of the brush, but ends up splitting the hairs. The 2 shades that I have are not very intense in pigmentation, so I needed several passes to get a fully opaque line, which invariably made it feather. I must say though that the shades are interesting alternatives to the usual black / brown. Finally, for an easy and comfortable way to wear a lip colour, THREE offers the Shimmering Lip Jam. These have a jelly-like texture to them, and offer a natural-glossy finish to the lips with just a tint of colour. They contain cherry extract and several botanical oils to hydrate and protect the lips. The applicator is curved like a little spoon to pick up the product and applies evenly across the lips. Overall, the base makeup items are interesting and definitely worth checking out. The other items are nice additions to my existing collection of colour makeup, but probably not crucial. If you are in Singapore, definitely stop by the store at Level 4 at TANGS Orchard where the first Rhythmic Spa outside of Japan has been set up, or check out the counter at Takashimaya Department Store.